Picture this: during the calendar year 2014, till 13 June, the S&P BSE Sensex has risen 19%, the S&P BSE 500 is up 22% and the S&P BSE Mid Cap index has soared 33%. Since most retail (and high net worth individuals, too, I daresay) investors wait for a rally to invest, the temptation is high to rush into mid-cap stocks and mutual funds at this point in time. There are many stocks that have doubled in value and this is the season to impress others at cocktail parties by throwing stock names that do not exist in the others’ vocabulary. How quickly things can change! And that, my friends, is the lesson that the equity market teaches: stay locked in to get the maximum benefits. But retail investors have been net sellers as per daily net figures of the exchanges, while foreign institutional investors (FIIs) were net buyers and hence, have reaped the benefits. The irony is that there was low to zero participation from retail investors in the mid-cap space in the past 3-6 months. Now, flows into mid-cap and the infrastructure space (so called high beta) have begun. Stars from a few months ago—information technology, fast-moving consumer goods and pharma—have been forgotten. During times like these, the investment adviser has to quickly move from the driver’s seat to the instructor’s, and exercise caution rather than encourage acceleration. Certain facts and numbers need to bear your attention. We are not denying that mid-cap has the potential to deliver higher returns over large-cap, but this comes with associated risks. There is a possibility that this risk can be reduced in the long run; but investors in mid-caps have to be prepared for the sharp volatility that these investments could bring. Is the mid-cap rally purely due to the new government at the Centre? The real tough times of low growth, high inflation have been on the way out for the past few months, and green shoots of higher company profits have started appearing. During the tough times, mid-cap investments were totally out of favour as well as battered. Markets normally react a couple of quarters before an actual turnaround (whether on the way up or way down), and this time was no exception. As soon as the mood changed, the valuation differential (which was large) over large-cap investment came to the fore, and mid-cap investments became the flavour of the season. However, analysis of the three main indices—Sensex, BSE 500 and BSE Mid Cap—will highlight what you may need to be cognizant of while making your investments. Data analyzed is annual returns for the calendar year from 2004 till 2013, and year-to-date figures till 13 June 2014. The Sensex has returned 16.7% compounded annual growth rate over these 9.5 years, while the Mid Cap index has delivered 14.8%. The BSE 500 lagged with 7.8%. In absolute terms, if 10 lakh was invested in each index, it would have reached 43.28 lakh in the Sensex, 37.16 lakh in the Mid Cap index and 20.43 lakh in the BSE 500. If the period reviewed is changed to just after the financial crisis (starting calendar 2009), the Mid Cap index is the best performer at 20.3% per annum, followed by the Sensex at 19.1% and the BSE 500 close behind at 18.2%. Returns are just one aspect to be considered; risks and volatility would be another. In the past nine completed calendar years, the Mid Cap index has given negative returns thrice; the Sensex twice, and the BSE 500 just once. The range between the highest and lowest return for the Mid Cap is 174% (worst: -66.9%; best: 107.7%) while the BSE 500 is much lower at 68% (worst: -38.4%; best: 29.6%). Standard deviations of the returns of the three indices easily reflect the lower volatility—18% for the BSE 500, and 50% for the Mid Cap index, with the Sensex in between at 38%. We are not even for a moment suggesting a pessimistic outlook to the markets. However, what works for clients always is a disciplined approach based on their own needs and risk capacity. Warning: follow your neighbour’s or colleague’s action at your own peril. Further, if you think you have missed the rally, and are under-allocated to equities, make sure you reduce the risks by entering in two or three tranches, with a clear long-term outlook. What is important to remember is that while large-cap cycles could be shorter at 3-5 years, mid-cap cycles could take 7-10 years. While the Sensex is 25% higher than the level during end-2007, and the BSE 500 is 55% higher, the mid-cap index is still 9% off those levels. 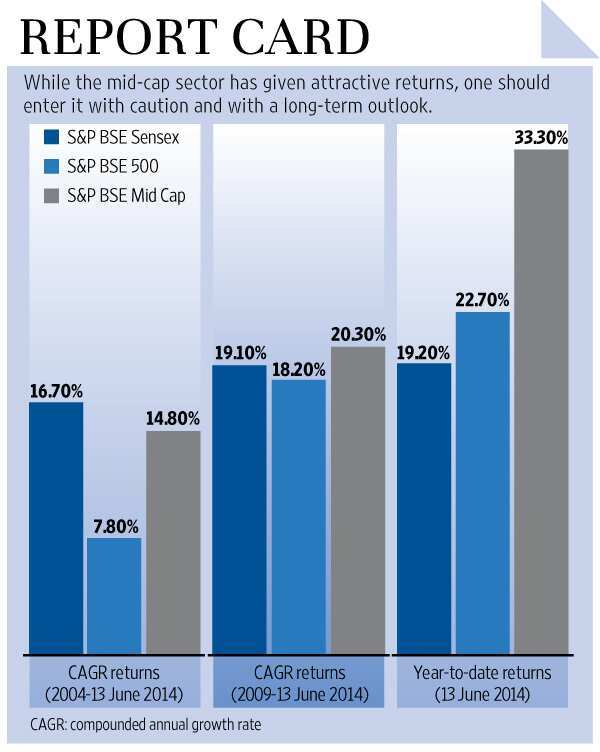 Enter the mid-cap segment of the equity markets, but with caution and a really long-term outlook. Lovaii Navlakhi is founder and chief executive officer, International Money Matters Pvt. Ltd.